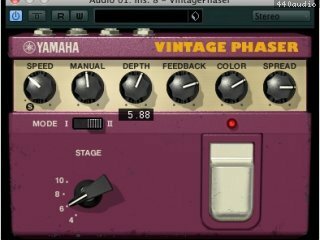 The Vintage Stomp Pack includes several effect plug-ins that exactly reproduce the analog sound of the original vintage guitar effects. Based on the progressive VCM technology, which provides an ultra-realistic sound modeling of the repective hardware image, the Vintage Stomp Pack fascinates by its rich and warm sound and an easy-to-use interface for a straightforward operation. The dual phaser Max 100 delivers the original sound of the 1970's hardware phasers. Modeled with VCM technology down to single circuitries and components of the original, the Max 100 even incorporates a reproduction of the light-sensitive CdS cell, which enables the Max 100 plug-in to exactly reflect the subtle change in character with modulation speed — just like the original. The Dual Phaser plug-in is a VCM technology-based reproduction of a legendary stomp box, tailored to guitarists who want to experience a truly authentic vintage tone. 2 LFO's, 2 phasers and 4 mode selectors allow a wide range of combinations for stunning effects. This plug-in combines the best qualities of the most popular classical phasers. Thanks to a large selection of mode settings, the Vintage Phaser is able to reproduce a range of completely different phaser types. Dedicated controls allow you to manipulate the rate of modulation, the center frequency, the depth of modulation and the amount of feedback. The Vintage Flanger is the counterpart of the Vintage Phaser, comprising the vintage sound characteritics of the 1970s with a superb modeling quality. The Vintage Flanger includes three Flanger types, each offering totally different sounds. Six settings such as Speed, Depth and Mix, allow a flexible and inspiring sound creation. The warm and gorgeous sound of this 1970's wah-wah effect is a must have for ambitious guitarists and producers who want to enjoy the sound of the "good old days". Four different wah-wah modes along with four different types plus overdrive and speed controls make this effect a creative experience.